“It’s time for our favorite announcement of the year! 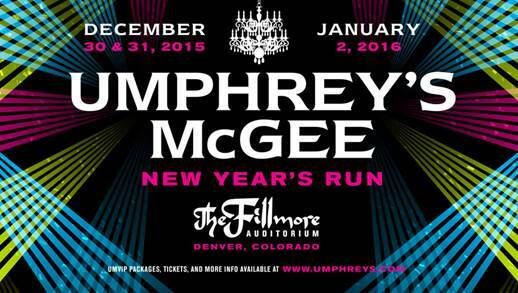 Umphrey’s McGee will return to Colorado to ring in the New Year at the Fillmore Auditorium on December 30, December 31 and January 2. On the heels of sold out shows at the Boulder Theater and Red Rocks Amphitheatre, we look forward to rocking the Rockies thrice more, and celebrating this special holiday tradition with you. In addition to the three shows at the Fillmore, team UM is cooking up a special one-of-a-kind Umphrey’s event to be held on January 1st. Details on this special New Year’s Day to be announced in the coming weeks. Tickets for Dec 30 & Jan 2 are $37.50 GA ADV and $40.00 GA DOS plus applicable service charges. Tickets for Dec 31 are $75.00 GA ADV and $80.00 GA DOS plus applicable service charges. VIP Tickets and 3 Day Tickets will be available via UM fan club.